The Spark: Academic Innovation Hub Building is technology rich, providing robust systems and flexible infrastructure to accommodate the rapid pace of technology changes. 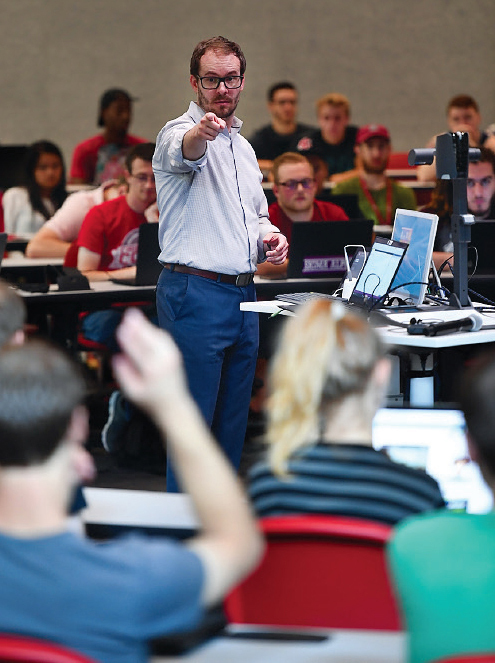 The Spark helps create opportunities for Washington State University to accommodate student population growth, energize and enable students and faculty, and address the tremendous advances made in understanding the way students learn. G45 is a lecture hall in the round. 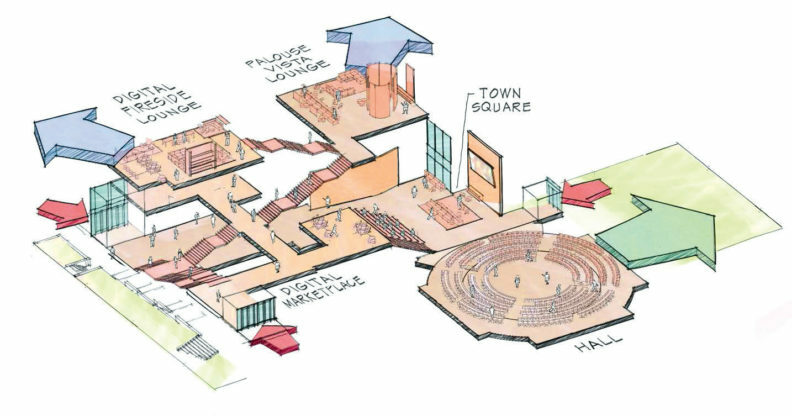 There are 277 seats arranged at a central teaching point on two tiers with three ramps reaching from the back of the room to the center. Students have a continuous table surface and can create think/pair/share moments by turning in their chair, to the side or to the table behind them. Students are encouraged to seat themselves toward the middle because power is provided in the tabletop in the first three rows. 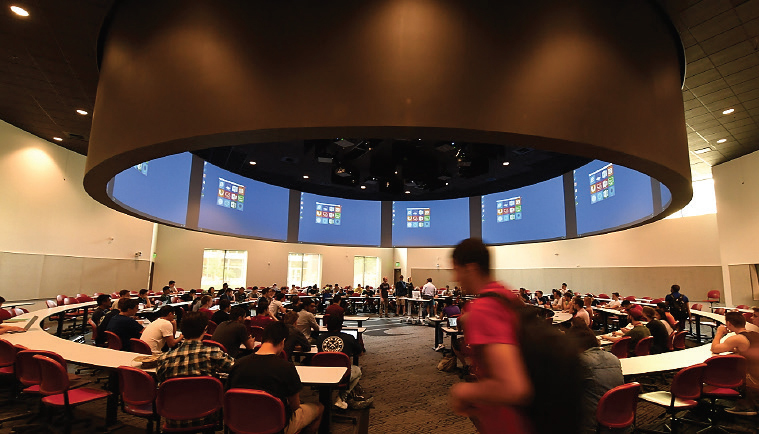 There are nine projectors suspended above the students in three groups of three. These projectors allow instructors to display three different content elements simultaneously. Cameras in this classroom enable lecture capture, videoconference connection or streaming of events. Active learning classrooms enable instructors and student to engage in a different teaching methodology. Students engage in activities, writing, discussion and problem solving to promote analysis, synthesis and evaluation of class content. The instructor serves as a facilitator/director toward these activities. Students are seated in groups around the room with technology available at each table for engaging in discussion and evaluation of content. The instructor is positioned in a way that allows control of media and content at each student group as well as a large projected display. Students may use their own technology as a source of collaboration or, as a group, use the fixed technology at the table. Active Learning Classrooms are available in the Spark with three different seating capacities: 42, 84 and 126. 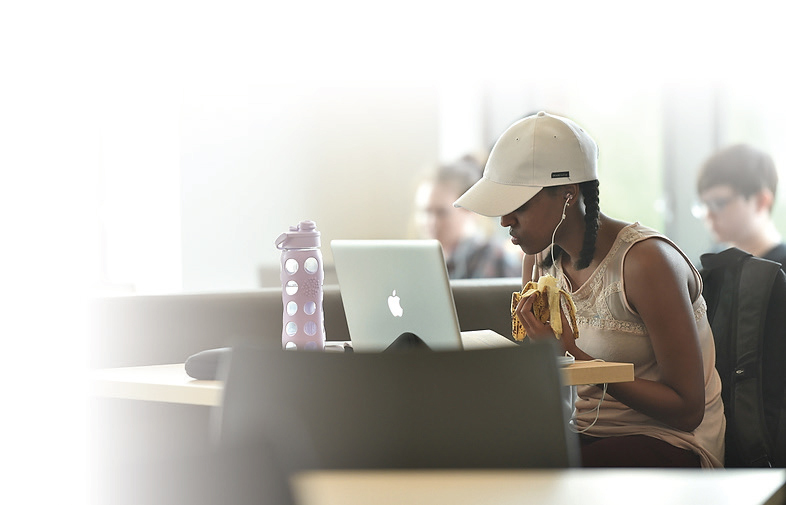 To support the high volume of students and longer hours of activity in the Spark, a Starbucks® café is located on the ground floor near the Event Space, open 7 a.m. to 4 p.m. Monday through Friday. Flexible classrooms serve as learning spaces with technology available for collaboration, displaying media content or connecting to spaces outside the classroom environment. These spaces include furniture that enables students to cluster in groups. Chairs rest on casters for easy movement. Tables stand on carpet glides so they can be pushed together or pulled apart for flexible seating arrangements. The main resource center for the Spark is the Information Counter, which is staffed by students from 7:30 a.m. to 11 p.m. Technical support, equipment checkout, material purchase and directions are available. Digital signage above the Information Counter continuously displays activities and events happening in the Spark. The Student Skills Studio is a welcoming space for students to engage others in activities and discussions, take a break between classes, study, or work on projects or media elements. There are two Recording Studios in the Student Skills Studio. With different seating styles available—meeting table, individual lounge chairs and study bar—the Student Skills Studio was designed so students could have a space to meet as a group, work with technology (available for checkout at the information counter) or have a place to study. The Spark Faculty Innovation Studio is an inviting space for faculty and instructors to meet with other faculty and support staff in activities and discussions, take a break between classes, attend workshops, or engage with instructional designers. With flexible seating styles available—meeting table, café booth or individual lounge chairs—the Faculty Innovation Studio was designed so faculty and instructors could have a space to consider the ways and means of experimenting with different teaching styles, technologies and modalities. Two recording studios are available to faculty inside the Faculty Innovation Studio to enable instructors to create or edit content and media pieces for class components and lessons. There are three feature walls in the Spark. 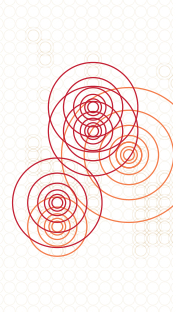 Each contains graphics unique to Washington State University, meant to invoke feelings of belonging and connectedness of the Spark to campus and students to the Spark. On the ground floor outside room G10, a large wall graphic includes a series of colors and circles meant to be a visual representation of the Cougar Fight Song. On the ground floor near the G45 entrance, the curved wall surface displays another graphics element of circles and colors. These are a visual representation of the concussive sound of the canon fired at WSU football games. The third feature wall is located on the main stairway between the second and third floor. This feature wall comprises colors and shapes meant to be a visual representation of the Victory Bell. The Victory Bell, purchased in 1882, originally sounded to indicate the change of classes. Today, we ring it after all home football game victories. The Spark Design Studio encourages faculty and students to engage in a design process/teaching style. From conceptualization to refinement, implementation and production, the tools and space in the studio accommodate this process. Production equipment available includes a workstation with various design and media tools, laser cutter, CNC machine, 3D scanner, and conventional and large-scale 3D printing. The Media Development Lab has 24 workstation PCs and two Apple workstations available for student use. 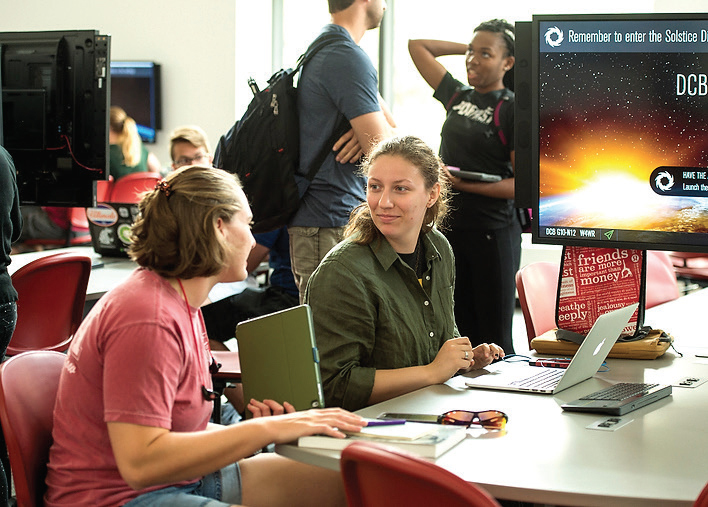 These workstations enable students to create content outside class, however the space also sits close to the Think Tank, which allows instructional activities in two spaces simultaneously during class. Open hours are available for student drop-in use, and AOI has a lab monitor available to help with logistical and technical questions. 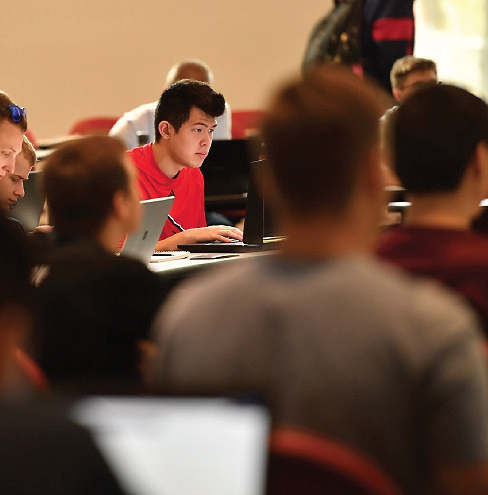 The Think Tank serves as a tutoring space for students. The WSU Writing Center staffs the Think Tank and offers help to students working on various projects and/or papers. There is work and lounge seating available as well as technology that allows students to collaborate, and view media materials and content. The Think Tank also enables students to schedule classroom space along with the Media Development Lab. When students schedule both spaces together, they can leverage them as a studio workroom/classroom or entrepreneurial-style classroom. Faculty Hoteling Offices are available on each floor of the Spark. Faculty and instructors may schedule these spaces for up to two hours per reservation. Instructors can hold office hours or help-sessions in the building close to their classrooms. Instructors can also reserve the space during class time and use it for one-on-one interactions during class activities. Faculty Hoteling Offices do not offer fixed technology in the room, but they are fitted with tables and chairs for 4–10 people. Collaboration Rooms or Problem Based Learning Rooms are scattered throughout the building on each floor. Students or faculty may reserve these spaces for up to two hours per reservation. Seating accommodates 6–10 people. Whiteboards and large flat-screen displays, and connection points for carry-in devices (wired and wireless) are on the walls. Open/Informal Learning spaces are scattered throughout the building on each floor. Students or faculty may simply walk up and start using them. Seating accommodates 6–10 people. Mobile whiteboards are located nearby. The large flat-screen display and connection points for carry-in devices (wired and wireless) are the central focus of the grouping. The technology purposefully resembles that in the active learning classrooms. 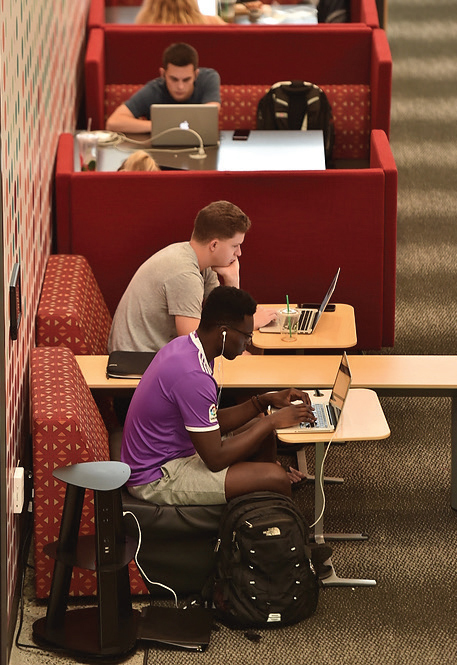 Open/Informal Learning Spaces are located elsewhere in the Spark and at other locations on the Pullman campus. Located on the ground floor between the large Active Learning Classroom and the large round classrooms is the Spark Event Space. In the heart of the Spark, the Event Space includes stadium-style wood benches and lounge furniture in a comfortable environment. Twenty-five displays are connected to form a large digital display capable of running continuous digital signage content. The display can also be used for event content, such as movies, presentation material and overflow from G45. When displaying signage, student-generated content has top priority if interspersed with informational content related to academic events and happenings. The Hill Climb Display is a large commercial-grade LED wall. It is visible from outside the building. When displaying signage, student-generated content has top priority if interspersed with informational content related to academic events and happenings. 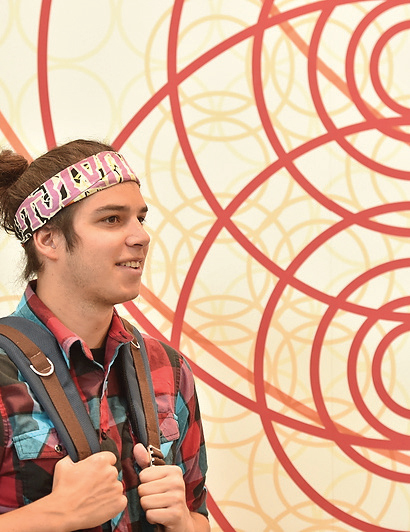 Students have opportunities to showcase and share ideas, scholarship and projects in the Spark. These opportunities are made possible through the Hill Climb Display, Event Space, large trophy case on the first floor and through posters created in the Media Development Lab. Faculty and instructors can coordinate these opportunities for their students with Academic Outreach and Innovation. 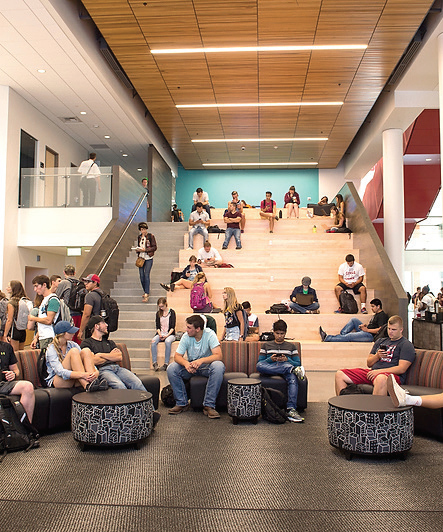 The Palouse Vista Lounge is a student lounge on the second floor of the Spark. The space includes lounge furniture, collaboration furniture and technology as well as an assortment of moveable tables and chairs. Three faculty Hoteling Offices are immediately adjacent to the Palouse Vista Lounge, making it an excellent location for students to hang out, meet with faculty and socialize. The Digital Fireside Lounge is a student lounge on the third floor of the Spark. The space includes lounge furniture, collaboration furniture and technology as well as an assortment of moveable tables and chairs. Collaboration Rooms and Faculty Offices are immediately adjacent to the Fireside Lounge, making it an excellent location for students to hang out, work on projects, meet with faculty and socialize. Just off the lounge is the roof deck, open as weather permits.